A perfect week's getaway for travellers in search of Costa Rica's natural beauty. From brightly coloured toucans to slow-moving sloths, the tropical forests of this tiny country teem with life. Volcanoes loom over wild rivers, and white-sand beaches nestle beneath a vivid green background, providing a wealth of rich and varied ecosystems for the wildlife lover. After arriving in San Jose, we will check-in to our conveniently-located hotel. San Jose lies in a fertile valley at an altitude of 1150 metres. Coffee and sugar cane are big industries here and coffee is even planted between new buildings and along the roadside on the outskirts of the city. This morning, an hour's drive will take us to Volcan Poas National Park, where the smoke from one of Costa Rica's most active volcanos rises majestically from the tropical rainforest. At almost a mile in diameter, the main crater is one of the largest in the world. Due to recent volcanic activity, time at the crater viewpoint is restricted to 20 minutes. If activity increases again the authorities may choose to close the park, and in that case you'll visit the Doka coffee estate instead. Then we will travel to Arenal (approximately 2.5 hours) where we will catch sight of the famous Arenal Volcano. This classic cone, which rises to 1633 metres, is covered by a tangled mass of vegetation on one side, while the other is starkly barren. Having remained dormant for hundreds of years, it erupted unexpectedly in 1968, destroying the small towns of Tabacon and Pueblo Nuevo on its west side. After this, it was known for its regular explosions, which became a huge spectacle at night. However, since 2010, the volcano has gone quiet once more. Our accommodation for the next two nights is in La Fortuna. The town was renamed after the 1968 eruption, when it was seen as being 'fortunate' that its location, on the volcano's eastern side, saved it from decimation. This evening, we can make the most of the local geothermal activity by enjoying an optional bathe in nearby hot springs. Today has been left free to explore the area as you choose. There are local treks to waterfalls and along lava trails whilst those keen to relax can enjoy spa treatments with volcanic mud, for the more active you may wish to go White Water rafting. Your Tour Leader will be able to provide information on all the options. This morning we will explore the Arenal Volcano National Park, home to one of the most majestic volcanoes in Costa Rica. We will take a walk on the flanks of the volcano where your leader will point out interesting flora and fauna and provide more information about the science and history of the volcano. We will walk to a viewpoint for a closer view of the volcano. Following this we will travel around Arenal Lake up into the cloud forest region of Monteverde - one of the most well-known places in Costa Rica to see wildlife. The last part of our journey is on bumpy roads, but we are rewarded with a two-night stay here to enjoy all that this area has to offer. Perched on the Continental Divide between the Pacific and the Caribbean, it is thought that there has been indigenous habitation in Monteverde since 3000 BC. However, the turning point in its recent history came in 1950, when a group of pacifist Quakers from Alabama moved here to avoid subscription in the Korean War. They sought a lifestyle in a country in which they could embrace their peaceful beliefs and continue to cultivate their dairy farms. These families went on to establish the community of Monteverde and some of its famed cloudforest reserves. 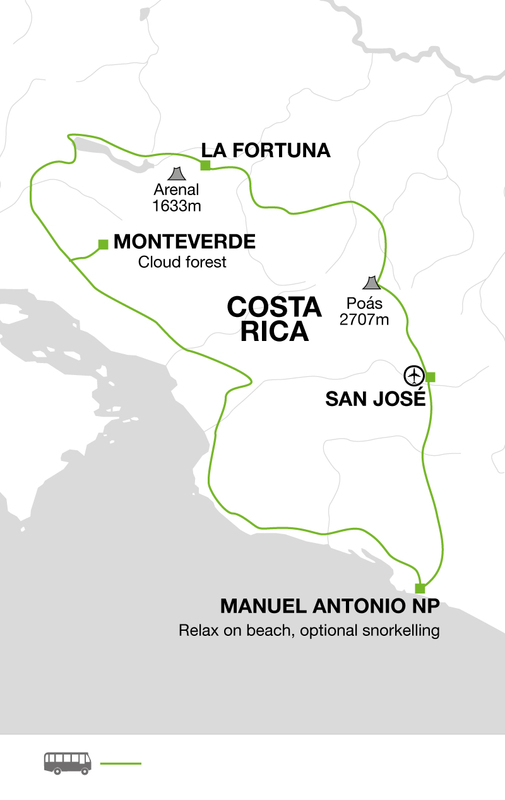 Monteverde is regarded as offering some of the best canopy experiences in the world. This afternoon, you may choose to 'fly' through the dramatic scenery on a zipwire, or take a more sedate walk through the canopy on treetop walkways. This evening, there is the opportunity to go on a guided night walk in search of nocturnal species, such as pacas and tarantulas. This morning, we will have a guided tour of the Monteverde Cloud Forest Reserve, walking the paths that wind their way through gigantic ferns, ducking underneath the lichen and moss that hangs from the giant trees. The jungle floor is often littered with blossoms that fall from the high canopy providing a carpet of colour amidst the endless green. The famous, but now very rare, resplendent quetzal is fairly commonly seen in this area, one of the last remaining places in Central America where its habitat has been preserved. Sacred to the ancient Maya and Aztec peoples, it is considered one of the most beautiful birds in the world and the best time to see it is during its breeding months of March and April. The rest of the day has been left free to enjoy one or several of the many optional activities available in the area. You may choose to visit the local butterfly or orchid garden. Alternatively, you may choose to enjoy a trek in one of the other reserves. Your Tour Leader will be able to offer advice on the options available. Leaving the cloudforest behind us this morning, we descend to the Pacific Coast, enjoying staggering views over the Gulf and Peninsula of Nicoya. Heading south, we cross the Rio Tarcoles Bridge from which huge crocodiles are regularly seen. We then pause at Carara Biological Reserve, famed for the scarlet macaws and abundant birdlife which populate this transitional forest. Finally, we continue along the Pacific Coast to Manuel Antonio National Park, where we will spend the next two nights. This morning, we explore the Manuel Antonio National Park, famed for its beautiful beaches and rich wildlife. During our time in the park, we are likely to see white-faced capuchin monkeys, coatimundi (part of the racoon family) and the tiny squirrel monkeys. This is also one of the best places in Costa Rica to see sloths. The majority of a sloth's diet comes from buds and leaves. As leaves provide little energy, sloths move only when necessary and even then very slowly so they are easy to spot. The remainder of the day can be spent relaxing on the white sandy beaches, enjoying a swim in the warm azure waters. The sunsets from this coast are spectacular and have to be seen to be believed. This morning we say goodbye to the Tour Leader and the rest of the group, who will be travelling back to San Jose for their flight home today. Those of you who have chosen to extend your stay with some time at the beach will remain at the Hotel El Faro, with its fantastic location at walking distance to the beach, as well as the National Park and the golden sands contained within. The hotel is uniquely designed from shipping containers, built into the hills of Manuel Antonio. The views from the rooftop restaurant and infinity pool are unbelievable, looking over both the beach and the surrounding forest. There are also several bars and restaurants in the small village of Manuel Antonio to spend the evening. The National Park is closed on Mondays, but there are lots of other activities on offer if relaxing on the beach isn't for you. Catamaran tours, horse-riding trips and rafting are all available. Options today include another visit into the National Park for wildlife spotting opportunities, or you may wish to simply relax on the beach. We drive to San Jose Airport (approximately 4 hours) where the trip ends. Lightweight clothing is essential in midsummer though a warmer jumper is advisable for cooler evenings in the highlands (Monteverde can be very cool at night). A good waterproof is essential, and you could consider waterproof trousers. The jungle lowlands around Arenal are hot and muggy, and it can rain at any time of year. Long trousers and long-sleeved shirts are recommended on jungle walks. Lightweight trail/walking boots for jungle walks, comfortable shoes/trainers and sandals. In the rainy season waterproof boots are recommended. One main piece of luggage and a daysack. Remember, you are expected to carry your own baggage - don't overload yourself. We recommend a sunhat, sunscreen, a small umbrella, a torch, insect repellent, a travel adaptor and a water bottle. Binoculars are essential for bird and animal spotting, and, for those interested, we also recommend bringing snorkelling equipment for your time at Manuel Antonio National Park. Local Crew: Although entirely voluntary, tipping is a recognized part of life in this region of the world. Some local staff will look to members of the group for personal recognition of particular services provided. Accordingly, you should allow US$ 30 for group tipping. In Manuel Antonio we use a quirky hotel called El Faro. Constructed from shipping containers that have been carefully put together to blend in with the hillside around the coast, the hotel is unusual and stylish. From the rooftop pool there are fantastic views out to the ocean, perfect for a sunset rum punch. We have created this tour for travellers who want to discover all of the major Costa Rican highlights but are short of time. Including the wildlife of Manuel Antonio, the cloudforest at Monteverde and Arenal's conical volcano, this trip will not disappoint the ardent wildlife enthusiast, as well as including a couple of days on Costa Rica's white-sand beaches to relax at the end of your stay.